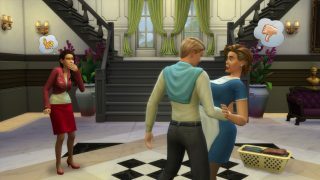 Are Your Sims Acting A Little More… Jealous? Have you noticed your Sims acting a little different recently? Maybe a little more… jealous? You’re not going crazy – your Sims might seem a more aware of their romantic surroundings after last month’s Update. We’re always working on improving The Sims 4, from fixing issues to adding new features. We recently added the Jealous Trait, but we also made some changes to the way jealousy works as part of improvements we’re making to the way Sims react to the world around them. Emotions in The Sims 4 makes Sims feel more believable. When you see a Sim get dumped, become Sad, and slink dejectedly away to go cry in their bed, you really feel for them. But at the same time, if a Sim doesn’t seem to notice what should be an important life experience happening around them, things start to feel off. With that in mind, we set out to improve the reliability and responsiveness of Sims’ Reactions. The Reactions system is what we use to make Sims aware of, and able to react to, things around them. So, marker in hand, we found a white board and started designing some solutions. The first reaction we wanted to focus on was Jealousy. After all, how believable is it if a Sim can cheat on their significant other right in front of them without provoking a response? The key to the reaction is to grab the spouse of a cheating sim and focus their attention on the cheating going on right in front of them. In the past, some reactions were only being triggered if a Sim was actually facing the event. This led to awkward situations like Sims being completely unaware of their spouse WooHooing with someone else, literally behind their back. We improved this so that Sims can better see (and hear) the things around them, rather than requiring line of sight. Sorry, adulterous Sims, you’re going to need to be a little sneakier moving forward. 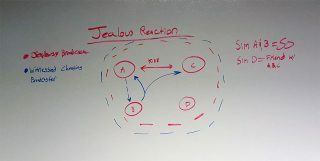 It’s also key to have different strengths of jealous reaction. After all, a spouse that is only flirting with another Sim should get a mild, disappointed response from their significant other, but a spouse kissing another Sim should get quite a bit stronger response – perhaps even a slap! These dramatic moments make our Sims feel more aware of their environment, and give us great opportunities to empathize with them. After improving the reliability and feel of jealousy reactions, we realized it was a great opportunity to allow players to create Sims that care even more about those situations. A Trait seemed like the perfect way to get these dramatic moments to occur even more often, and with even more fireworks! These Sims feel very strongly about being around their significant other whenever possible. Sometimes even innocent conversations can set them off, and when they feel slighted, they take things even more personally. So there you go! We hope you’ll have fun playing with the Jealous Trait, and let us know about all the romantic hijinks your Sims run into. Want to learn more about The Sims 4? Check out more details on The Sims 4 Get Together Expansion Pack and check out how The Sims 4 Get Together’s Clubs breaks the rules.